Soluble in DMSO, methanol, ethanol or acetone. Insoluble in water. 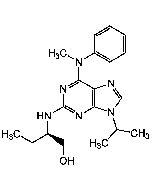 Potent GABA receptor α-4 subunit and β-3 subunit inhibitor. Broad-range insecticide. Blocks GABA A-gated chloride channels and glutamate-activated chloride channels (GluCls) in the central nervous system, resulting in overexcitation of the insects nervous system and muscles. Induces oxidative stress in mouse kidney and brain. Increases CYP1A1, CYP2B6, CYP3A4 and CYP3A5 transcript, protein and enzyme activity levels.